After pizza, gelato, and pasta, "Where to find the best pastries in Rome," should be one of every traveller's most important questions. Italian pastries are some of the best in the world and when you find the perfect pasticceria (bakery) and spend every Saturday/Sunday morning in fluffy, creamy, chocolatey heaven, you'll know true contentment. Whether you prefer southern Italian pastries (cannoli, pasticcioti), northern (castagnole, strudel di male), or Roman (maritozzi, crostata di ricotta e viciole), you can find life changing dessert-for-breakfast at Pasticceria Regoli. To truly experience this pasticceria, clear your weekend morning schedule, eat a light dinner the night before and go prepared to want every single thing in those beautiful glass cases. 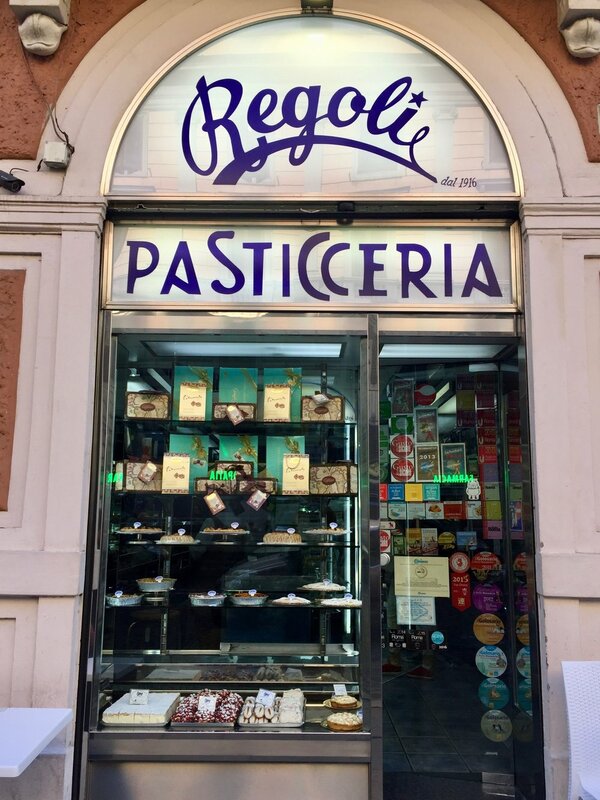 There are two separate parts to the Regoli, a pasticceria and a cafe right next door. The trick is to go first to the bakery, pick out all the treats you think you can handle and then head to the cafe. While you sip on your cappuccino or espresso, your pastries will magically arrive through a secret door and all of your Italian pastry dreams will come true. I tried a tortina con fragole and a maritozzo, while Edoardo got millefoglie and a cannolo. After 5 minutes, we were in a sugar-induced heaven. The coffee was well-made and the staff was very friendly and informative. I'd call it an overall success. We'll definitely be back soon and next time we might even get some pastries to go for a snack at home (yes, they do that too).